Hawthorne’s chocolatey-brown, from Alaska. Huckleberry’s a buff blond from Montana. Both were orphaned in the wild – and now they’re “brothers” here at Northwest Trek. Come meet our grizzly cubs! Our grizzly cubs Hawthorne and Huckleberry are adorable to watch. Born in winter 2018, they love to climb, play, explore and discover their environment. But they also need to go back in their dens sometimes for food and a nap. See them together every day that we’re open. Both cubs were orphaned in the wild in summer 2018: Hawthorne in Alaska, Huckleberry in Montana. Neither would have survived without their mom. 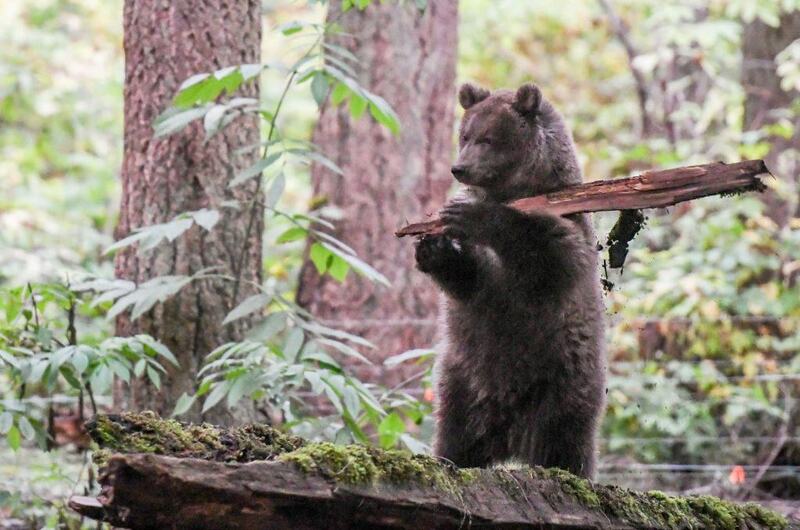 Cared for by local zoos, they then came to their new Northwest Trek home in August. Meanwhile, we were renovating their forested habitat, thanks to a Metro Parks Tacoma bond approved by Tacoma voters in 2014. We’ve had grizzly bears since 1993, but these are the first grizzly cubs in our 43-year history. So we took a lot of care to cub-proof everything! Our fans also voted on their names, which are based on Northwest native plants: the hawthorn tree and the huckleberry, a staple of bears’ diets in the wild. The two adopted “brothers” are now together in their habitat, playing and exploring together. Meanwhile, our cubs will be ambassadors for their cousins in the wild. Northwest Trek supports grizzly bear conservation, especially in Washington. You can help too – find out more here. Hawthorne was born in early 2018 in Alaska. His mother was killed by poachers while she was still nursing him, and the orphaned cub was rescued near Nome and cared for by Alaska Zoo. Curator Marc Heinzman brought him down to his new home at Northwest Trek in August, 2018, where he quickly settled in. He was named in a public voting after the hawthorn tree, a thorny native Northwest plant. Hawthorne is dark chocolate-colored with a white crescent moon around his neck (grizzly bears can have blonde, brown or even black fur) and loves to play with the enrichment toys he gets from keeper Angela Gibson. He’s quick to bang around anything he can carry or throw, and likes to rearrange “furniture” in his den. Huckleberry was born in early 2018 in Montana. He was orphaned after his mother was legally killed (she was attacking pigs on a farm), and rescued on Blackfeet Nation lands. Cared for at first by Montana Wild, he then made his way in August 2018 to his new Northwest Trek home, where he settled in well. Huckleberry is a buff blond with dark brown paws (grizzly bears can have blond, brown or even black fur). He’s great at balancing and climbing, and a little quiet and shy. Grizzlies are one of the largest terrestrial predators in North America, with blond, brown or black fur and silver guard hairs that give them their common name. They have long curved front claws, a prominent shoulder hump made of muscle and a long snout. Full-grown, they're 6.5 feet long and around 3 feet high. Grizzly bears live in remote areas of Montanan, Wyoming, Idaho, Washington, southwest Canada and Alaska. They're endangered in Washington, with only a handful left. They eat a variety of food: large and small mammals, carrion, salmon, fruit, plants and insects, depending on what's in season. Breeding in May-July, females give birth to a litter of 1-3 blind and helpless cubs, each weighing about a pound. A bear's most important senses are smell and hearing. 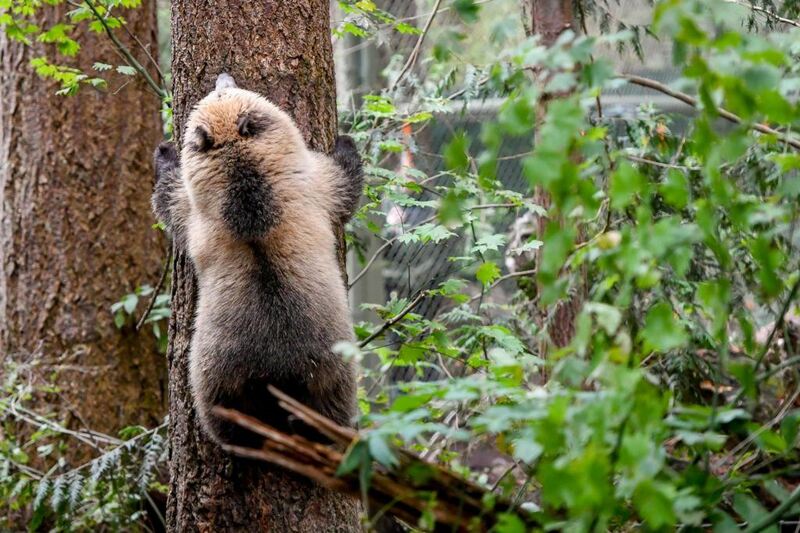 Young cubs can climb trees, but adults get too big. Double the cubs, double the fun. 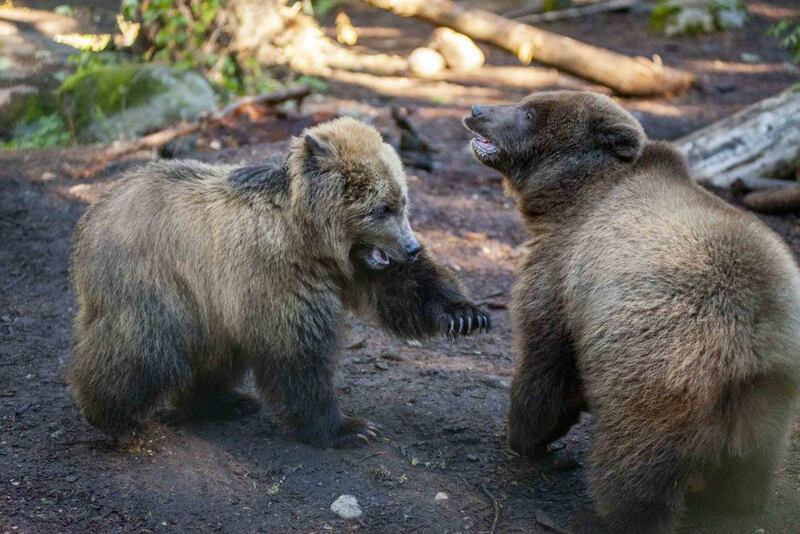 Our grizzly cubs now share their outdoor habitat together - watch them! Hawthorne climbs the log over the pool. Huckleberry has fun splashing the waterfall. How do cubs play? Hard!